Farting, vomiting and manipulating everyone around them, Yorgos Lanthimos's complex women are also enthralling to watch. It's tempting to tie pretty much anything to do with women and power to #MeToo and the surge of mainstream feminism, to the point where anyone in the public pop culture eye can (and probably should) be expected to speak on the topic. And “The Favourite” does feel weirdly relevant in today’s political climate, in which female politicians are more high-profile than ever, yet still seen as pitted against each other, rather than their much-more-numerous male counterparts, to the detriment of everyone involved (see also: the recent insurgency against Nancy Pelosi, comparisons of Hillary Clinton and Elizabeth Warren, etc.). But period piece aficionados and recreational Oscar-watchers might get their feathers ruffled over “The Favourite,” which features scatological humor, gout and a pet duck among its political and romantic court intrigues, along with three wholly unlikeable female characters engaged in a political (and romantic) battle of wills. She then finds herself struggling to retain control of Anne when Sarah’s wide-eyed cousin, Abigail (Emma Stone), arrives on the scene with her own agenda. Although Abigail starts out scrubbing floors, she soon finagles her way into a role as Sarah’s maid and then leapfrogs into a baroness role, courtesy of a dumb and horny young courtier played by Joe Alwyn; from there, she assumes the position of Anne’s new favorite, as the Queen makes very explicit to Sarah. But is Abigail as power-hungry as Sarah? Or have they all been played by Anne, who seems helpless but, despite the gout and the overeating and the fondness for a passel of pet bunnies, is still the Queen? Selling viewers unpleasant or downright unlikeable female protagonists isn’t easy, despite more modern mores about the roles of women. “Tully,” for instance, was all but ignored when it came out in May, despite brilliant work by Charlize Theron as an overextended mother and Mackenzie Davis as her charming young babysitter. Its writer, Diablo Cody, also penned the equally prickly “Young Adult” in 2011, with Theron as a deeply dysfunctional YA novelist who leaves a trail of destruction in her wake. And, true enough: Anne’s court is a hothouse of intrigue, lust and greed, and the mucky details of the period are ripe enough to smell. “The Favourite” revels in the sheer unlikability of all of its characters, though their jagged bits are smoothed down by how absurd everything in the movie is. Most everyone (except Anne’s beloved bunnies) in “The Favourite” are untrustworthy at best, and all of the male characters are powerless twits who race ducks and, in one slow-motion scene, throw oranges at a man wearing no more than a Whig wig. “So I guess the positive aspect of this film is that we tried, in our small contribution, is we tried to show them as complex and complicated and wonderful and horrific as they are, like every other human being,” he added. 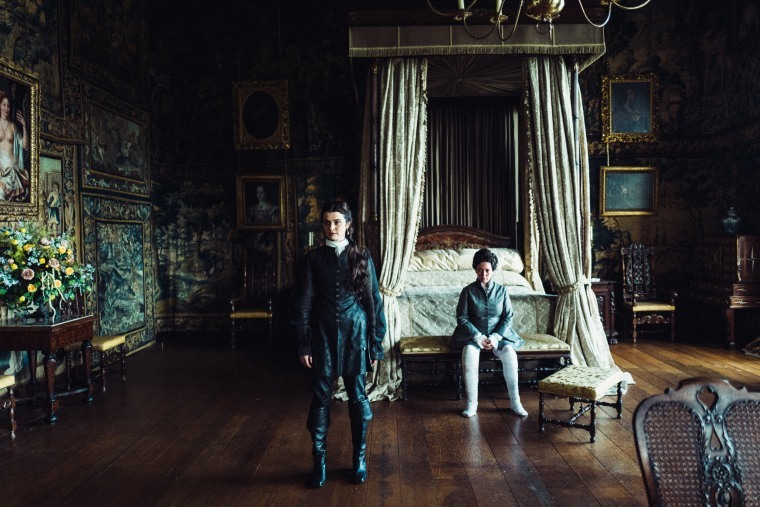 “The Favourite” is being positioned for an Oscar run, not just because it’s a rich period drama, but also because it seems to tie into the current wave of pop culture feminism. However, that will be a real test for viewers: They think they want ladies being edgy and naughty or asking for equal pay, but when Queen Anne describes her female lovers’ particular skills in scatological terms or eats cake until she vomits and then eats some more, I suspect viewers might be less than keen on visualizing the complexities of female desire. To the casual Oscar watcher, it seems like the awards are often handed out based on what the voters think the movies mean about them; there’s a reason that movies about Hollywood win big, or that movies which make white people feel good about themselves for not being racist do as well. So the question for Favourite fans is really whether we are ready to look up at the screen and see ourselves reflected in the puke-y squabbles of Queen Anne and her crew. If not, it’s about time we all loosened our corset strings and faced the music. Possibly while farting.